Radical Islamists attack Northern Nigeria, Killing 60 people and burning homes. Amnesty International says the terrorists attacked the northeastern Nigeria border town of Rann, The town was almost destroyed, and left in flames. 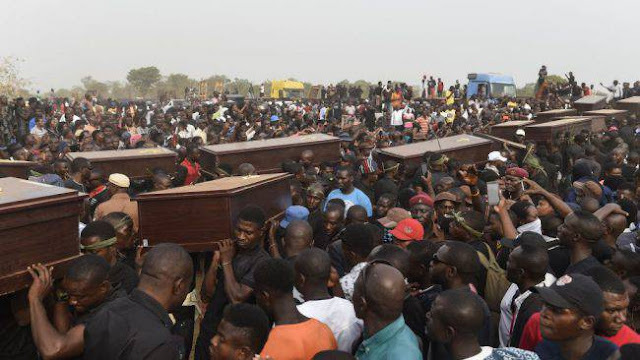 The attackers, believed to be from the Boko Haram terrorist group, drove motorcycles through the town near the Cameroon border, killing people and setting their houses on fire. Amnesty tweeted satellite imagery of the town which shows hundreds of burned structures. The group reports tens of thousands of people have fled the area near the border with Chad in recent weeks due to an extremist "resurgence" there. "We have now confirmed that this week's attack on Rann was the deadliest yet by Boko Haram, killing at least 60 people. Using satellite imagery we have also been able to confirm the mass burning of structures as Boko Haram unleashed a massive assault on Rann, most of which is now destroyed," said Osai Ojigho, director of Amnesty International Nigeria. "Boko Haram has consistently and deliberately targeted civilians in Rann, which makes the Nigerian authorities failure to protect people all the more unacceptable," Ojigho said. "Many people were in a state of shock and were clearly distressed by what they had witnessed. Now they have lost all that they have," said Hugues Robert, the Nigeria program director for Doctors Without Borders.